Paul Chryst has told his team all season, not to worry about the College Football Playoff rankings. Just keep winning the next game on their schedule and things would work out. It took 12 wins, but the Wisconsin Badgers (12-0, 9-0 Big Ten) are finally there, ranked fourth in this week’s rankings and will most likely be one of four teams to play for College Football’s National Championship if they can beat Ohio State in Saturday night’s Big Ten Championship game against Ohio State (7:17 p.m.) in Indianapolis. The Badgers ranked 9th in the first College Football playoff rankings. Ohio State (10-2, 8-1 Big Ten) is ranked number-8, up one spot from 9th last week. The final rankings will be revealed at 11 a.m. on Sunday on ESPN. The national semifinals are set for Jan. 1, at 4pm at the Rose Bowl in Pasadena, California, and at 7:45 p.m. at the Sugar Bowl in New Orleans. The national title game will be played at 7 p.m. on January 8 at Mercedes-Benz Stadium in Atlanta. If the Badgers lose to Ohio State on Saturday night, they’ll likely be left out of the College Football Playoffs. Clemson (11-1) was the No. 1 team in Tuesday’s latest playoff rankings. Auburn (10-2) is number two and Oklahoma (11-1) is third. Alabama (11-1) dropped to number-5. The Wisconsin Badgers (10-0, 7-0 Big Ten) climbed three spots from 8th to 5th in the third College Football Playoff rankings that were revealed on Tuesday night. The latest rankings put the Badgers in a good spot to secure a spot in the season ending College Football Playoffs if they can run the table and win the Big Ten Championship game. Three teams that ranked higher than the Badgers last week, #1 Georgia, #3 Notre Dame and #6 TCU all lost last week which meant a big shakeup in the top 10. Alabama moved into the top spot, followed by Clemson, Miami and Oklahoma. 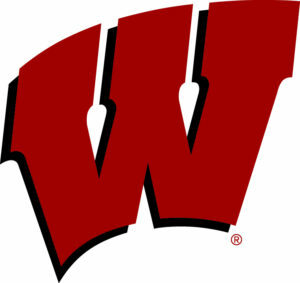 The Badgers, who knocked off Iowa 38-14 last Saturday, will play host to the Michigan Wolverines (8-2, 5-2) this Saturday at 11 a.m. at Camp Randall Stadium. The Wolverines carry a three-game win streak into Saturday’s game. The Wisconsin Badgers moved up one spot to number-8 Tuesday night in the second week of the College Football Playoff rankings. The Badgers (9-0) will host the Iowa Hawkeyes at 2:30 p.m. on Saturday at Camp Randall. Iowa debuted at number-20 this week. The top five stayed the same. Georgia (9-0) is number 1, followed by Alabama (9-0), Notre Dame (8-1), Clemson (8-1) and Oklahoma (8-1). Ohio State (7-2) dropped from seven to thirteen. Penn State (7-2) fell to 14th. Also ahead of the Badgers is TCU (8-1) at number-6 and Miami (8-0) is number seven. The 4th ranked Wisconsin Badgers are 9th in the initial College Football Playoff rankings which came out on Tuesday night. UW (8-0, 5-0 Big Ten) was the third-highest Big Ten team, behind Ohio State at number six and Penn State at number seven. Georgia opened the rankings number-1, followed by Alabama, Notre Dame, Clemson and Oklahoma to round out the first five. It’s not a big surprise that Wisconsin finished lower than their rankings in the Top 25 polls. They have yet to play a ranked team and none of the teams left on UW’s regular-season schedule is in the committee’s top 25. Michigan, normally a ranked team, is hurting the Badgers. They’ll visit Madison on Nov. 18 and as of now, are unranked. The Badgers travel to Bloomington this Saturday to face the Indiana Hoosiers. With a weekend of college football upsets, most people expected the Wisconsin Badgers to move up in the College Football Playoff rankings. But when the new rankings came out last night (Tuesday), the Badgers stayed put at number-7. Wisconsin (8-2) has won four straight games. They can clinch the Big Ten West Division title with wins at Purdue on Saturday and at home in the regular season finale against Minnesota a week later. Alabama is number-one, Ohio State (9-1) moved up three spots to number-two. Michigan is third followed by Clemson, Louisville and Washington. Penn State is one spot behind Wisconsin which is seventh.